Young and Successful are the words! The Diploma of Education (D.Ed.) programme aims at developing the understanding and competencies required by practising teachers for effective teaching-learning process at the secondary stage. This programme prepares prospective teachers to understand the psychological and sociological aspects of the child’s development and also understand his behaviour under different conditions. The course work combined with rigorous practice of teaching prepares teacher trainees to master the art of teaching and the ability to deal with students based on their individual differences in various classroom situations. The D.Ed. Program aims to train teachers for the schools in the government/private sector in India and abroad. The curriculum and evaluation systems adopted by the college are similar to those used in the typical Colleges of Education. Emphasis is given to the development of domain knowledge and teaching skills. They take foundational and experiential coursework to enable them to meet the students with linguistic, cultural, learning and behavioral diversity. Senior/Guest Lecturer for different kinds of seminar to improve students theoretical and presentation knowledge for their future. • To provide a rich programme of curricular and extra-curricular activities for student teachers for all round development of their personalities as also those of the students whom they teach. Curriculum The Syllabus and Courses of study in the D.Ed. programme are as prescribed by the SCERT, Haryana from time to time and also governed by its regulations/statutes. There shall be four compulsory papers of 100 marks each. One optional paper of 100 marks and two teaching subjects of 100 marks each. The practice of teaching shall be done through Micro and Macro lessons to be delivered by the pupil teachers. The practice of teaching shall be of 300 Marks. 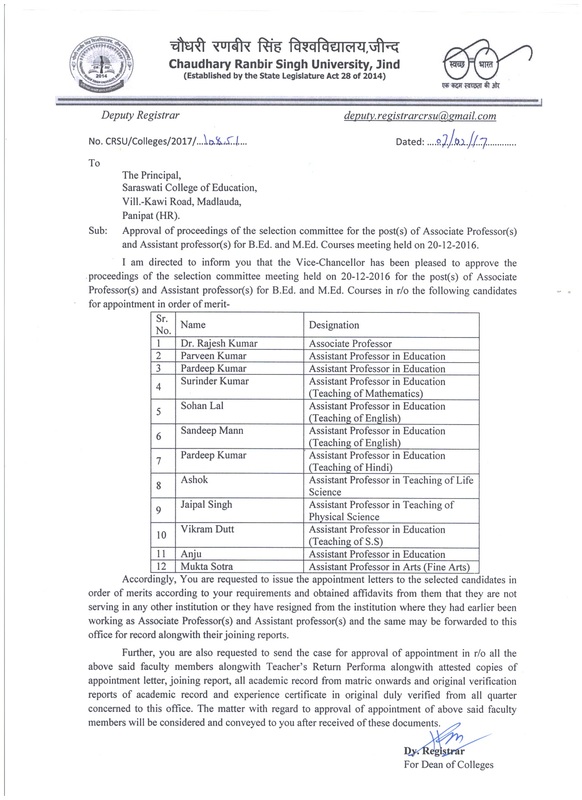 Out of which 150 marks shall be awarded by the two external examiners for two final lessons to be observed in the two teaching subjects offered and internal examiner shall award the remaining 150 marks. The candidate should have Sr. Sec./10+2/Intermediate pattern in any discipline or equivalent with not less than 45% aggregate marks (40% for SC/ST candidates). 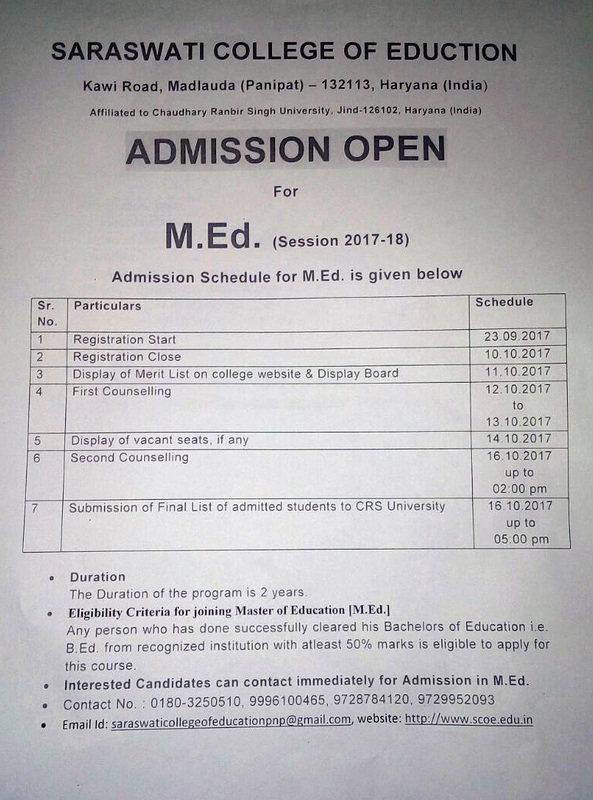 Fees & Other Charges The candidates admitted to D.Ed Course by the SCERT, Haryana are required to deposit fee and other charges as prescribed by the SCERT, the details of which can be had from the SCERT /College office at the time of admission. Fees and other charges are revised by the SCERT, Haryana from time to time. 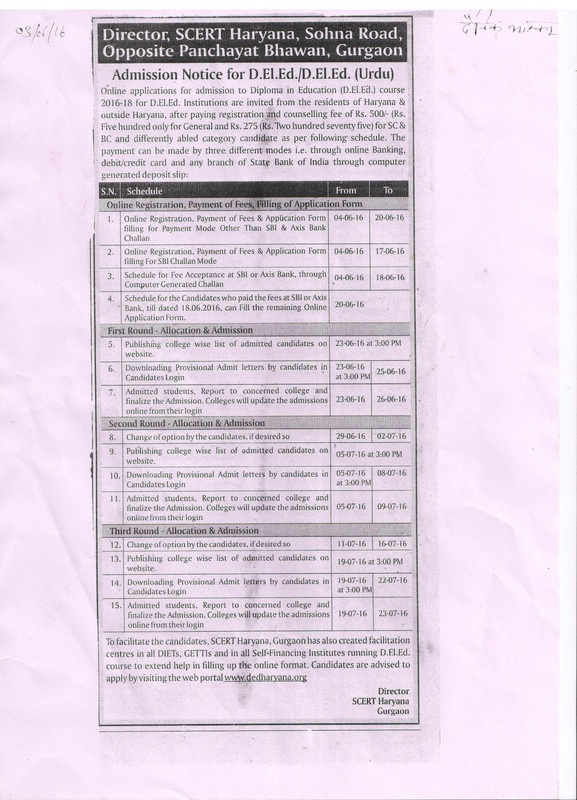 Difference in amount if any will have to be paid as and when demanded by the college authorities.